Our overall goal for this program is to improve understanding of interactions between water resources, water quality, climate change, and human behavior in agricultural and urban environments, including exploring how primary water users can be involved in the research process to develop scientifically sound and economically feasible public policy. The WISDM approach integrates a system of existing and widely-applied models into an interdisciplinary framework that allows us to address the key issues surrounding the sustainability of water resources. 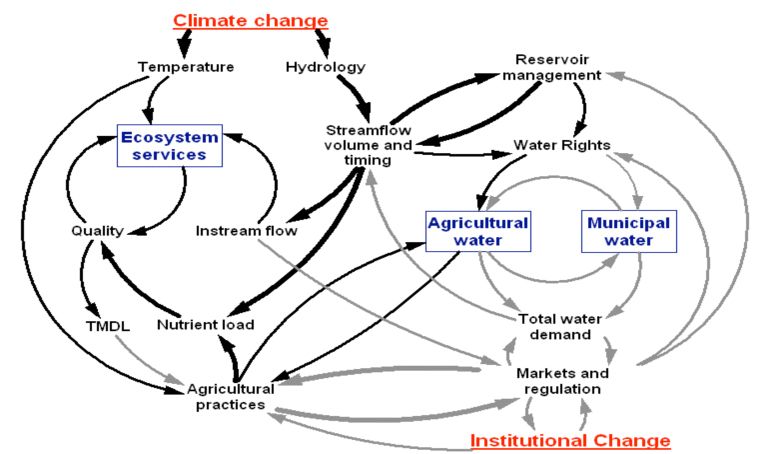 This approach houses a complex integrated biogeochemical / economic model (BioEarth-Land) within a system dynamics modeling environment, a user-friendly, graphics-based approach that allows concerned stakeholders and scientists to jointly generate ideas for and explore adaptations to existing water regulatory institutions. 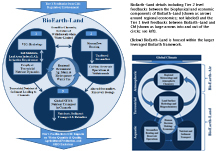 To achieve stakeholder input to WISDM via collaborative modeling (CM), the primary linkages and feedbacks in BioEarth-Land will be identified using sensitivity analysis and incorporated into a system dynamics model in a simplified way such that non-researcher stakeholders can easily adjust key assumptions and parameters, allowing these participants to explore the first order impacts of water regulatory institution adaptations. 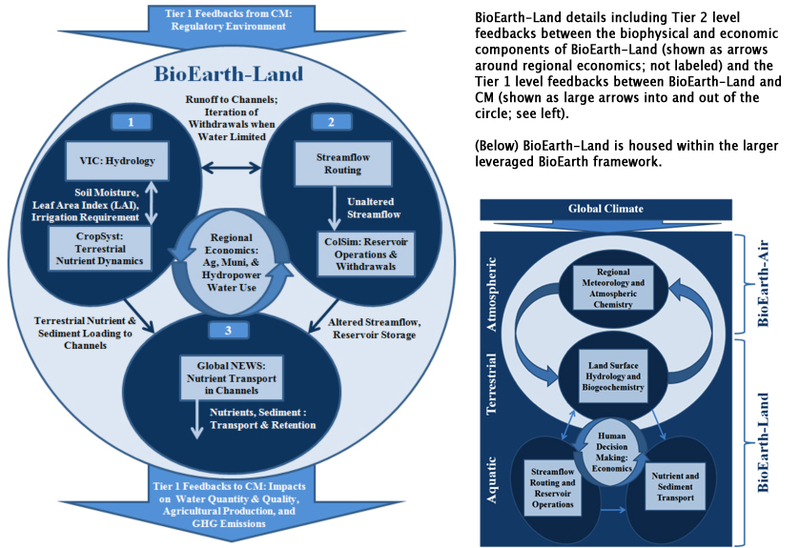 Offline from the CM activities, stakeholder-conceived and vetted regulatory changes are used to drive the BioEarth-Land model to analyze the impacts of these adaptations on multi-sector water availability, agricultural production, ecosystem services, GHG emissions, and hydropower production. Finally, these impacts are brought back to the CM to further refine adaption of the water regulatory institutions. Determine what agricultural practices (e.g., crop mix, fertilization, irrigation, and tillage) will promote agricultural productivity under a new hydrologic regime while preserving water quality and minimizing GHG emissions. Explore possibilities for how dam operation could evolve to meet irrigation needs associated with sustained agricultural productivity, along with competing in-stream flow and hydropower requirements, under anticipated climate variability and change. Consider how changes in demand and supply-side economic conditions and climate change affect water use across space and time, and how will (or can) regulatory institutions adapt as water becomes increasingly scarce. By carrying out these studies in representative sub-basins across the CRB; these simulations and feedbacks will proceed in dynamic communication with regional-scale modeling, with smaller-scale work providing parameterization for the regional scale, while the regional scale provides boundary conditions for the smaller scale work. We expect to transform understanding of how complex water and climate science can support public policy to improve water conservation and water quality in the face of climate change.